Chia seeds are tiny small black and white seeds, but nutrient rich. A member of the mint family, these were once cultivated by The Aztecs. It is native to central and southern Mexico and Guatemala and is still widely used there. 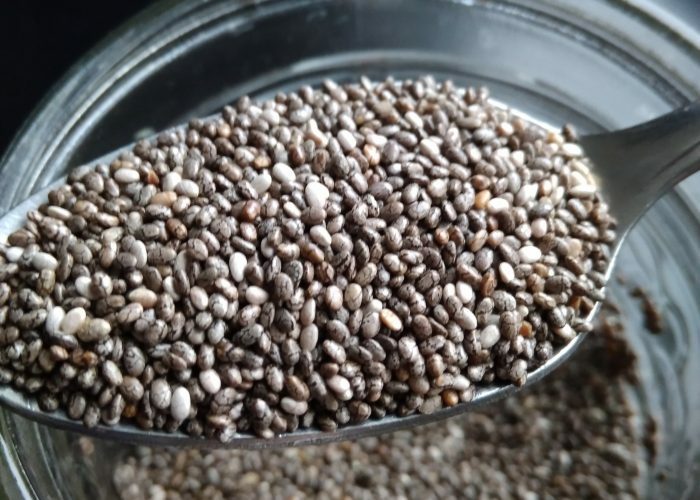 First, what’s the nutritional profile of a serving of chia seeds (equivalent to about 2 tablespoons, 28 grams or 1 ounce)? One such serving provides approximately 138 calories, 9 grams of fat (mainly polyunsaturated fatty acids), 179 mg calcium, 10 grams of fiber, 5 grams of protein, 2 grams of iron and also contains alpha-linolenic acid omega-3s! Chia seeds are impressively versatile. They can be eaten whole or ground up and added to many foods either sweet or savory. Sprinkle the whole chia seeds onto your breakfast cereal, into salad, pudding or yogurt. Add about 3 tablespoons of whole chia into ½ cup -1 cup of hot liquid like milk, almond or soy milk, and it will expand and become gelatinous, so this may make a good hot breakfast option. You can even add chia seeds to fruit drinks or into soups like chicken soup to add texture and nutrition. Besides all this, chia seeds can be used effectively in baking. You can add chia seeds into the batter to make homemade goods or substitute for pectin in jams, or turn chia into a gel (mix one part chia seeds to six parts water) and take one tablespoon of this gel to substitute for a large egg in egg free recipes. Combine ground chia with flour to improve the nutrient profile of baked goods in muffins, cookies and cakes, or even use chia to lighten the texture of gluten-free items like waffles and pancakes. This chia gel can further be used to bind veggie patties or thicken soups. As chia seeds have only a very slight nutty flavor, some may find it a bit ‘tasteless’. However, the seeds make up for flavor by adding crunch and texture. The only downside is that when sold on their own, chia seeds can be quite expensive. A 150g packet (containing about 10 tablespoons) costs about US $4.99 at Trader Joe’s. Nowadays, manufacturers are also adding chia seeds to snack foods like granola bars and many other products are likely to be coming out soon. So look out for these products or try adding some chia seeds into your kitchen recipes! 1. Academy of Nutrition and Dietetics. What are Chia Seeds? http://www.eatright.org/resource/food/vitamins-and-supplements/nutrient-rich-foods/what-are-chia-seeds. Accessed November 30, 2015.